An article in the newest (September 2007) edition of Enterprise Magazine features an interview with me. Black Hole Blog covers social media and how credit unions can embrace it. I talk about how CUs can respond to bloggers, and the writer, Laureen Griffin, also writes about ChangeEverything.ca. She also interviewed Gene Blishen and Trey Reeme. I’ve seen a few articles like this, but I thought this particular one was insightful. It must be hard to write an article that is at once basic and also helpful, knowing that your readers will range from those who don’t know social media at all, to those who are eager to try it out. If a member of your credit union was standing in the middle of a town square in front of a rapt crowd, praising or criticizing your service or products, would you go outside and listen? 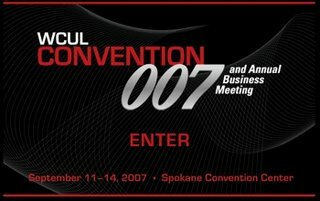 If you could go to free credit union conferences to learn about the biggest innovations in credit union marketing, would you go? If your credit union could be the Roman Forum of the community, where people shared their concerns, and spoke from their hearts, would you do it? If you answered “yes,” then you are ready to dive into the blogosphere. A nice way of framing the issue, I think. I’ll be co-hosting their Spectrum Marketing Awards Dinner, which should be a lot of fun. I was delighted to be asked, and it’s a great chance to see the best of the marketing coming out of the credit unions in Washington State. I’ll also be doing a panel on Using Web 2.0 to Build Relationships with Shari Storm of Verity Credit Union and Virginia Brady of UFirst Federal Credit Union’s The Boardcast. I may also help out with the Trabian guys on their panel Social Media Phenomena Explored. I’ll blog from the event, and I’ll see you there! One of the interesting things about coming to an event like BarCampBankSeattle is trying to explain it to people who have no framework with which to contextualize it. What’s a BarCamp? Why a BarCamp for banking? Why not just have a regular conference? What are you doing down there in Seattle? Why on Earth would a grown man go to Banking Camp? It’s only now struck me that with new tools emerging to allow for greater online collaboration, whether you’re talking about BaseCamp, Facebook, Del.icio.us, LinkedIn or Second Life, the needs for in-person collaboration is changing. For people who are not using these new tools, nothing has changed and therefore they don’t need new ways of interfacing with their peers. But for those of us who have embraced these new tools and found that they have significantly improved their ways of collaborating and working together, we want our real world events to change too. Along comes BarCampBankSeattle. I wouldn’t be interested if a traditional conference was organized this way because you’d be in a room full of people who want content served to them, just like people who are used to traditional web experiences (the irony of a term like “traditional web experience” is not lost on me) want content served up to them. They aren’t used to co-creating and collaborating. So the idea of BarCampBank – that the right people are here and the right things are being discussed – really works because the people who have opted in to this process are all on the same wavelength when it comes to collaborating and working together. The guys at Trabian are leaders in this space, because their employees live in different cities and still work together through tools like AIM, Twitter, blogs, Facebook, BaseCamp and so on. So a loose, informal heavily collaborative event like BarCampBank makes perfect sense to the people who are here because we want new models for in-person meetings that fit into our new working relationships. The penny dropped and it’s amazing to be here. I’ll format my thoughts properly and post some content this week – I promise. My Net.Finance podcast at OpenSourceCU. Thanks to Trey and Brent at OpenSourceCU who have turned my Net.Finance presentation in April into a podcast. I hope it holds up without the visuals.